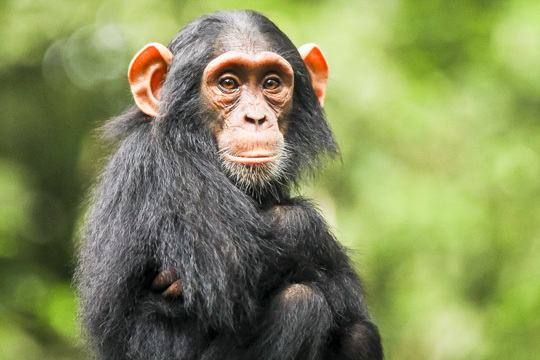 The true everlasting chimpanzee experience is a 1 day chimpanzee island chimpanzee tour. How? Here you take a step and get to personally feed these life apes and close human relatives. Every ones happines to visit the true man kind wildlife. Anyway, this tour has a half tour and a full day at the island sanctuary. Details of a 1 day ngamba island chimpanzee tour. Its either your in Kampala or entebbe. Then we drive to the entebbe landing Where we set off by 9:00am and lead our way to the sanctuary for a boat cruise of between 45minutes to 1.5 hours. On reaching the island, you will be happily welcome by the island staff and they will equip you with best information about the chimpanzees and the island at large. At this point, you will be able to see the first feeding of 11:30am and you will participate by staging at the raised platform and go on to feed the chimps. And the second feeding time will be at 2:00pm. Again the chimps come into an open area to get on an appetizer fruits given to them. And they will go ahead to show them skills into capturing the food given to them. Afterward, if there is still enough time, you can sun bathe at the beach and bird watching is also possible in the forest and also swimming is so perfect. The later on get back on tebow boat for the transfers to the main land and then to your lodge or airport. End of 1 day ngamba island chimpanzee tour.